A brand-new Murphy bed can easily cost more than $3,000. The thing is, we think furniture that makes the most of your square footage shouldn't have a huge price tag. That's why we created this list of 12 DIY Murphy bed projects that won't torpedo your bank account. Jacque and her husband Matt from The DIY Village built a Murphy bed for their craft room so it could double as a guest room. Depending on your budget you can use hardwood, plywood, MDF or particle board to construct a Murphy Bed. Jacque and Matt picked PureBond hardwood plywood. They say the professional grade building material enhanced the strength and beauty of their finished project. PureBond products are also formaldehyde-free and certified by the Forest Stewardship Council. The couple's tutorial includes more need to know tips. A spring or piston lifting mechanism could more than double the cost of making a Murphy bed. The hardware takes the effort out of opening and closing but if you're willing to sacrifice a little convenience to save money consider ​the Lori Wall beds Kit. It's a mechanism-free solution that makes it possible to create a custom Murphy for less money. How does the Lori Wall Bed open and close? The design relies on good old fashion muscle power. To help counterbalance some of the weight, the bottom of the bed frame has rounded "rocker" edges that double as shelving when closed. Each Lori wall bed kit comes with building plans and assembly fittings (more than 200 hinges, screws, connectors, and bolts!) Customers can pick from two types of bed orientations: vertical or horizontal, and three different bed sizes: twin, full or queen. You know you're only human. But that doesn't mean you can't build this DIY Murphy bed by Steve at Woodworking for Mere Mortals. He designs projects for folks with limited budgets and zero building experience. To kick things off, he purchased a DIY kit from Murphy Bed Hardware. Just like the kit we mentioned earlier, it comes with all the stuff to assemble a lifting mechanism plus building plans for constructing the cabinet and bed frame. 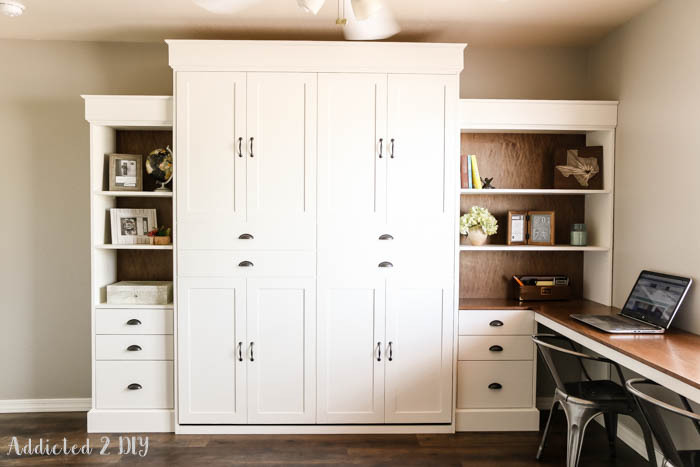 This Murphy bed office combo by Katie at Addicted 2 DIY blew our minds. Katie created a one-of-a-kind furniture system that includes the bookcases and desk. The frosting on the cake is the bed cabinet. When closed it resembles a storage wall so those not in the know would never guess it conceals a mattress. The mechanism kit for Katie's queen-size Murphy came from Rockler. She also downloaded the company's step-by-step instructions for building the cabinet and shelving units. Afterward, she modified the building plans to suit her space and needs. See part one and part two of her tutorial. Paul from Renovations and Old Houses was inspired to build his DIY Murphy bed using pieces from IKEA's PAX series after his wife saw this IKEA hack from Herbie's World and this IKEA hack from Jerry's Projects. All three projects incorporated a floor mounted bed frame with a spring mechanism from ​Murphy Bed Frame. When assembled and installed it's an all-in-one free-standing device that supports, lifts and lowers a mattress. To conceal, just build a cabinet around it, Paul's tutorial shares how. Here's another DIY Murphy bed that's also a PAX IKEA hack. Norwegian blogger, Calvin Gross from Huskverna, says if you're making a unit for a full-sized mattress you'll need several things including two PAX wardrobe frames and a couple of LURÖY slatted bed bases. This money-saving DIY by Imgur user Avalon Awaked explains how to build one for a heck of a lot less. The sofa and ottoman are from IKEA's SÖDERHAMN series. To simplify the DIY process, he purchased The Next Bed. It's a Murphy bed mattress frame with a lifting mechanism that you can anchor to a wall or floor that's easy to assemble. Keep in mind, Avalon created a custom mount for the bed frame so it would open over the sofa. Afterward, he made a Murphy bed cabinet with built-in storage using white melamine. This project by David Picciuto at Make Something TV shows how to make a simple Murphy bed using Side Mount Deluxe Murphy Bed Hardware from Rockler. Each kit includes instructions, but if you find them confusing, David's video gives an overview of the steps. Need to make room for a grade schooler? Martin Vester used leftover parts from an IKEA Ivar storage system to create a small Murphy bed with built-in shelving for his tiny home office. What's our favorite part of this project? Martin used three of the plywood shelves to create a bench for blankets and sheets. Take a peek at the tutorial. Many Murphy beds are freestanding pieces of furniture that you bolt to the wall or floor. The blogging sisters behind Junk in Their Trunk, share how to create one that seemingly disappears like magic without using an expensive lifting mechanism. Junk in Their Trunk ​shares photos and tips of their DIY for free here. Andrew and Crystal Odom are the tiny house dwellers behind Tiny Revolution, a site that promotes small space living. Since they couldn't fit a traditional Murphy bed in their home, they came up with a similar idea called the roll out bed. What's inside this two-box design? The front box conceals an accordion style bed frame on castors. Inside the second one is a foam IKEA mattress. 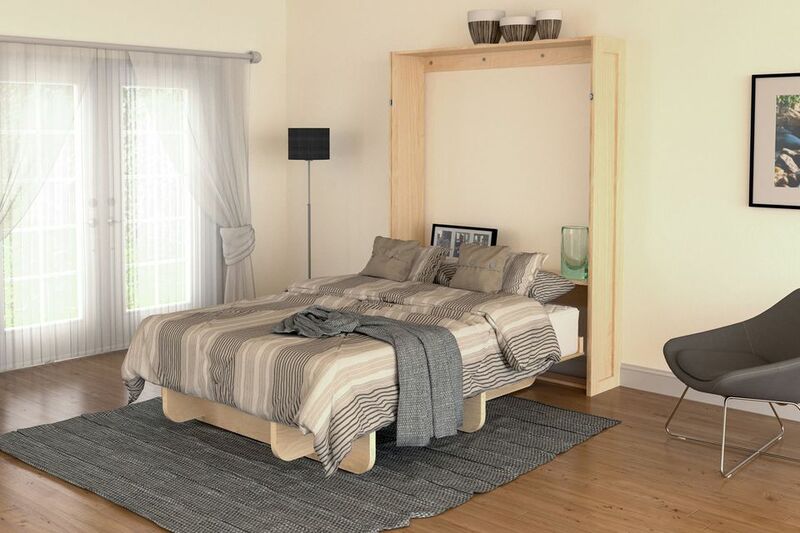 The do it y​ourself Murphy Bed Kit by Wilding Wall Beds comes with everything you need to create a functional Murphy bed including the pre-cut lumber. Once it's assembled ​you can customize the cabinet using crown molding, paint, and beautiful hardware. Kits are available in your choice of wood: alder, cherry, mahogany, maple or oak.